The spectacular coastline of New South Wales is a wonderful aquatic environment offering many opportunities for a wide range of water sports and activities. However these &apos;open ocean&apos; waters command respect as at times they can become dangerous to the unwary. 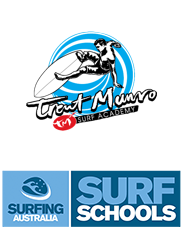 To help your group understand the dynamics of the ocean and learn where and when dangerous conditions may be present, Trent Munro, Professional Ocean Lifeguard and world renowned pro-surfer, offers a comprehensive series of safety courses to teach you how tho read the beach and potential hazards. These programs are excellent for local or excursion school groups and are tailored to any large group looking to educate the importance of the ocean and its environment whilst having a lot of fun in and around the ocean!